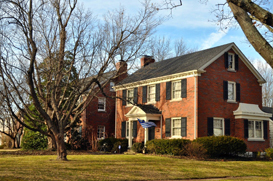 Chevy Chase is located in southeastern Lexington, Kentucky. This community is an upper to middle class neighborhood. Chevy Chase real estate listings are mainly single-family homes with some complexes and small and medium apartment buildings. This is an area of historic homes that were constructed prior to 1939. In addition, there are homes built between 1940 and 1969 and from 1970 to 1994. Chevy Chase is bordered by Cooper Drive to the south, Tates Creek Road to the west, Chinoe Road to the east and Fontaine Road to the north. Residents of Chevy Chase are served by the Fayette County School District. This district has 72 schools and 36,998 students enrolled in the schools. The Fayette County School District is a highly recognized district with students scoring higher than average on public tests. The education level rating in Chevy Chase is 10, with 5 being the average for the U.S. Residents of Chevy Chase include a majority of executives and those who work in managerial and professional capacities. As a neighborhood of Lexington, residents of Chevy Chase enjoy numerous amenities and job opportunities. Lexington is known as the “Thoroughbred City” and the “Horse Capital of the World.” Many people residing in Chevy Chase enjoy horseback riding and there are several areas in the the Lexington area where riding is possible. Lexington is also the home of many arts organizations. The city has a professional orchestra, professional theater, two ballet companies and many museums that provide residents with entertainment and a history of this area. There are also many annual events and fairs that attract people from all over the state. Residents of Chevy Chase choose the Lexington metro area in which to work. This city was named 5th best city for “Businesses and Careers” by Forbes Magazine in 2008 and 5th best city for “Young Professionals” by Kiplinger in 2008. Lexington is the home of many large corporations, including the Fortune 500 companies of Hewlett Packard, Lexmark International and Affiliated Computer Services. Chevy Chase is an attractive option for families, retirees, investors and young professionals. Lexington has a great job market with low unemployment rate and a variety of major companies that operate out of the city and within a short drive from Chevy Chase. Read more. $157/SqFt Average Price per SqFt.